Mr. Duane Tarnacki has worked with and volunteered for the Council of Michigan Foundations over several decades. He is author of the classic text, "Establishing a Charitable Foundation in Michigan," has served as legal counsel for the Council of Michigan Foundations’ board of trustees, and has provided ongoing legal support for the development of community foundations as a consultant during the implementation of the Michigan Community Foundations' Youth Project. Mr. Tarnacki has provided legal assistance to individual foundations in Michigan, and also to the infrastructure organizations supporting the work on a statewide basis. He has been deeply engaged in many of the projects described in Our State of Generosity. Mr. Duane Tarnacki talks about his career in philanthropy. Mr. Duane Tarnacki talks about the success of CMF leaders in advocating for foundations in public policy. 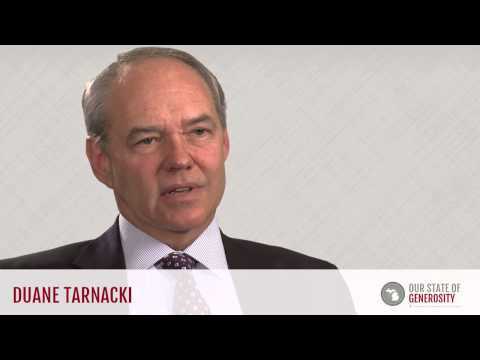 Mr. Duane Tarnacki talks about the success of Learning to Give. Mr. Duane Tarnacki talks about how Michigan philanthropy benefited from the resources donated by local industry titans. Mr. Duane Tarnacki talks about the Michigan Community Foundations Tax Credit and the legal definition of a community foundation. Mr. Duane Tarnacki talks about how the Michigan Community Foundations' Youth Project (MCFYP) worked to grow community foundations across the state of Michigan. Mr. Duane Tarnacki talks about the volunteer leadership at the Council of Michigan Foundations (CMF). Mr. Duane Tarnacki talks about the process and inspiration for writing his book, "Establishing a Charitable Foundation in Michigan." Mr. Duane Tarnacki attended the University of Michigan for his bachelor’s degree, which he received in 1976 with high distinction and honors. He then went to the University of Notre Dame’s law school, graduating with a Juris doctor degree and a master’s in business administration, receiving both with honors. In 1980, upon graduation from the University of Notre Dame’s law school, Mr. Tarnacki began working as an associate with the Clark, Klein, and Beaumont law firm in Detroit, Michigan, now Clark Hill. At the time, Mr. Tarnacki was involved in hospital reorganization and nonprofit hospital work, and recalls that early in his career he was approached by his colleague, Leonard Smith, who was representing the Council of Michigan Foundations (CMF). Mr. Smith explained to Mr. Tarnacki that the president of CMF wanted a book for guiding individuals on how to establish a foundation in the state of Michigan. Over the course of his career, Mr. Tarnacki wrote several other books that serve as pertinent reference tools for Michigan philanthropists, as well as philanthropists nationwide. These books include Law and Responsibilities: A Primer for Trustees, Directors and Officers of Michigan Private Foundations, and The Responsibilities of Service: A Guide for Directors of Nonprofit Organizations in Michigan. Mr. Tarnacki also co-authored The Michigan Community Foundation Legal Reference with Malvin E. Bank in 1996. Mr. Tarnacki is respected as one of the legal experts in the nonprofit and charitable organization field. He received the Outstanding Nonprofit Attorney Award in 2003 from the business law section of the American Bar Association and was named Lawyer of the Year by Best Lawyer for nonprofit/charities law in Detroit in 2012. Mr. Tarnacki was also named in “Best Lawyers in America,” “Michigan Super Lawyers,” Who’s Who in America, and Who’s Who in American Law(1). Mr. Tarnacki has served as the primary legal counsel for CMF since 1988, including representing the Michigan Community Foundations’ Youth Project (MCFYP) for its entire existence. Throughout his involvement with CMF, Mr. Tarnacki witnessed the components that make philanthropy in Michigan successful. He attributes much of the state’s success to dynamic leadership, volunteer leadership, and respect. Mr. Tarnacki explained that leaders such as Dorothy A. Johnson and Robert Collier have “been very successful in getting great volunteer leadership and good boards.” This involvement at the board level then raises the bar and encourages employees to work harder and be more cognizant of what is happening within the organizations. A notable moment in Mr. Tarnacki’s career was helping to define the term “community foundation” when the Michigan Community Foundation Tax Credit of 1988 was adopted. The purpose of the law was to permit a taxpayer to reduce Michigan income tax or Michigan business tax liability by a credit of 50 percent of the amount contributed to a community foundation. While individuals within CMF understood what a community foundation was, it became evident that others did not. Local municipal foundations were being created, calling themselves community foundations in order to receive this credit. It was therefore necessary to clearly and legally define what constituted a community foundation within the state. Over the years, this definition has proven to be extremely helpful. For years, Mr. Tarnacki has been dedicated to the nonprofit and charity sectors in Michigan, as demonstrated through his extensive board and committee service for various foundations and organizations. He has been involved with the Michigan Manufacturers Association, served on a legal subcommittee for the national Council on Foundations, the Michigan State Bar Foundation, and was a founding director of the Michigan Supreme Court Historical Society, to name just a few of his roles. Mr. Tarnacki was interviewed regarding his insights and experiences in working with Michigan’s philanthropic community and the Our State of Generosity (OSoG) partners. The following are selected quotations from his interview specifically related to the five organizing themes of the OSoG project.